Maintain absolute silence in the library. Every student must read books from the library. Every student will have one non-transferable library card. 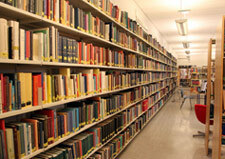 Books are issued and collected back during the library period only. A book is issued for one week, and maybe re–issued for another week only. A duplicate library card will cost Rs.25/-. Every student should return the card before the academic years ends. The loss or damage to the books will incur a fine amounting to the double cost of the book. Every student is expected to follow strictly the guide lines given by the Librarian. 2015 © All Rights Reserved by St.Peter’s College, Agra Designed & Maintained by : Franciscan Solutions Pvt. Ltd.